34 | Kitchen & Bath Design News | August 2015 Showroom Appeal Sub-Zero, Wolf, Asko and Best brands in 14 states. The 5,750-sq.-ft. space is an architecturally-driven, consumer- centric shopping experience. "In the past, we used different kitchen and bath designers to design each vignette, and while the vignettes were beautiful, the space itself was fractured," comments Denise Manu, v.p. of marketing for Roth Distributing. "We decided to go with an architectur - al frm this time because we wanted continuity between the spaces." In addition, since the building is from the 1930s, "it was a very chal- lenging space to work in. We believed an architectural frm could handle the challenges of the space," she adds. Arch11 reconfgured the all-con- crete showroom space into a loft-like environment. "Instead of taking the approach of multiple vignettes, we thought about how clients custom- ize their spaces," ofers Manu. "We asked ourselves questions about how the customer wants to shop, and went from there." 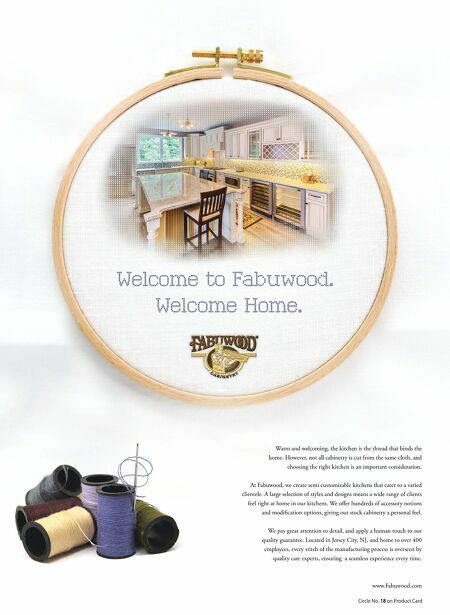 Three vignettes – Active Family, Home Chef and Urban Living – were developed, based on three of the most popular types of customers the show- room sees. All feature elements that will appeal to specifc consumers. Urban Living is a smaller, more high-end display that refects apart- ment or similar living. Home Chef, with its more transitional design, ofers a range of products that will appeal to a cooking afcionado. The third, Active Family, includes a large island to accommodate today's mod- ern family on the go. In addition to the kitchen displays, Arch11 also designed a wine bar that incorporates multiple wine units. "It's where the bartender sets up when they have events," reports Clarie Jordan, senior associate for Arch11 and project manager for the show- room. E.J. Meade, principal and owner of Arch11, and Jeremy Ehly of Arch11 were also part of the project team. In addition, a working cofee bar located at the front of the showroom includes a new cofee system. Appli- ances are also displayed along one wall of the showroom. At the back of the showroom is an interactive gourmet demonstration kitchen that features a 21'-long, solid surface island that can seat up to 20 people. The area can expand and con- tract with a retractable glass panel wall that provides clear views into the space. 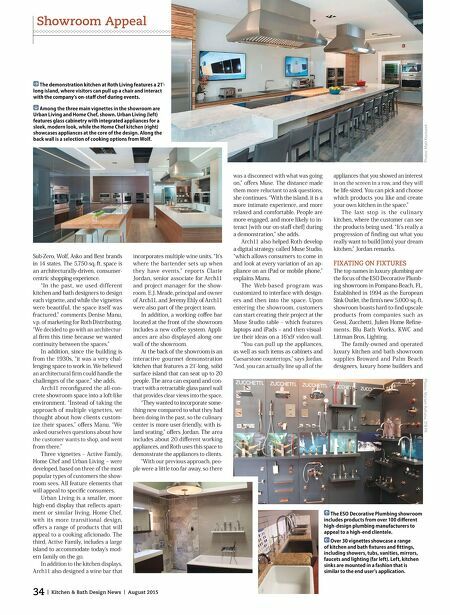 "They wanted to incorporate some- thing new compared to what they had been doing in the past, so the culinary center is more user-friendly, with is- land seating," ofers Jordan. The area includes about 20 diferent working appliances, and Roth uses this space to demonstrate the appliances to clients. "With our previous approach, peo- ple were a little too far away, so there was a disconnect with what was going on," ofers Muse. The distance made them more reluctant to ask questions, she continues. "With the island, it is a more intimate experience, and more relaxed and comfortable. People are more engaged, and more likely to in- teract [with our on-staf chef] during a demonstration," she adds. Arch11 also helped Roth develop a digital strategy called Muse Studio, "which allows consumers to come in and look at every variation of an ap- pliance on an iPad or mobile phone," explains Manu. The Web-based program was customized to interface with design- ers and then into the space. Upon entering the showroom, customers can start creating their project at the Muse Studio table – which features laptops and iPads – and then visual- ize their ideas on a 16'x9' video wall. "You can pull up the appliances, as well as such items as cabinets and Caesarstone countertops," says Jordan. "And, you can actually line up all of the appliances that you showed an interest in on the screen in a row, and they will be life-sized. You can pick and choose which products you like and create your own kitchen in the space." The last stop is the culinary kitchen, where the customer can see the products being used. "It's really a progression of fnding out what you really want to build [into] your dream kitchen," Jordan remarks. FIXATING ON FIXTURES The top names in luxury plumbing are the focus of the ESO Decorative Plumb- ing showroom in Pompano Beach, FL. Established in 1994 as the European Sink Outlet, the frm's new 5,000-sq.-ft. showroom boasts hard-to-fnd upscale products from companies such as Gessi, Zucchetti, Julien Home Refne- ments, Blu Bath Works, KWC and Littman Bros. Lighting. The family-owned and operated luxury kitchen and bath showroom supplies Broward and Palm Beach designers, luxury home builders and The ESO Decorative Plumbing showroom includes products from over 100 diferent high-design plumbing manufacturers to appeal to a high-end clientele. Over 30 vignettes showcase a range of kitchen and bath fxtures and fttings, including showers, tubs, vanities, mirrors, faucets and lighting (far left). Left, kitchen sinks are mounted in a fashion that is similar to the end user's application. Photos: Matt Kocourek Photos: Myriam Rofrano, STB PR The demonstration kitchen at Roth Living features a 21'- long island, where visitors can pull up a chair and interact with the company's on-staf chef during events. Among the three main vignettes in the showroom are Urban Living and Home Chef, shown. Urban Living (left) features glass cabinetry with integrated appliances for a sleek, modern look, while the Home Chef kitchen (right) showcases appliances at the core of the design. Along the back wall is a selection of cooking options from Wolf.